Are you responsible for arranging events within your company? Are you an agent seeking a wild card venue? Whatever the occasion, why not visit our venue and see how your event could take place. Even if you are not currently planning an event; this is a great opportunity for you to visit for future events. 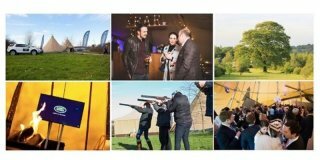 Bawdon Lodge Farm is an idyllic location for corporate events set in the heart of the Charnwood Forest, in rural Leicestershire. Conveniently located between junction 22 and junction 23 of the M1 and just 4 miles from Loughborough town Centre, Bawdon Lodge Farm will have you experiencing the countryside without having to venture too far. Not just a Field on a Farm! As an award winning wedding venue in operation for four years; our specialist team are experienced in both organising and co-ordinating events. Take a guided tour of the grounds & fields, visit the Tipis, Barn, Bell Tents & Meeting Room. See the best location to hold your event. Meet the teams from Bawdon Lodge Farm and Sami Tipi, join us for a bite to eat, cup of - something warm or something created by our bar team. Meet local Restauranteur David Hallam from Browns Lane Restaurant, Loughborough and discuss all things foodie for your events. Chat around the fire pit and take in the splendour of the tipis. Feel free to bring your colleagues along and share this free event with business associates. A very relaxed opportunity to visit our local, rural, unique and flexible venue. Free Parking onsite. Please note: The tipis will be situated on the field. Heeled footwear is not recommended.